Hey friends! In addition to this Low Carb & Delicious Berry Crisp recipe I also wrote a post about how I’ve managed to find a way for us to all spend time together like we did in the old days. Read “A Place For My Community Again” by clicking here. So most of y’all know that I’ve been low carb for almost three months now and I love it. Read about my journey at the bottom of my low carb recipe post (click here). But let me tell ya, a girl has needs. Fortunately for me, food needs are ones that are pretty easy for me to accommodate and I have found that eating low carb is one of the easiest ways of eating I have ever adopted. So today, we are going to address my need for fruit crisps because it was just about getting the best of me and I hit it out of the park with this little experiment of mine. I’m not saying I didn’t share, I’m just saying that I *might* have made this on a night Ricky was working late in order to get all I wanted first :). In short, it was OH mercy, so so so good! I really enjoyed the added flavor my low carb ingredients gave to the topping. In place of ice cream, I poured a little heavy cream over my serving like my ancestors used to do, and that tasted like melted ice cream and just sent this over the top. Heavy cream is a welcome bonus when you are eating keto! You won’t need “weird” or hard to find ingredients for this so just stick with me while I explain what you see here. Almond Flour/Meal can be found at Wal Mart now. I have also found it at every other grocery store I shop at. Wal Mart has it near the flour and Kroger has it in the health food section. This is basically ground almonds and is WONDROUS as a crisp topping because of the toasted nut flavor it adds. When it comes to sweeteners, you can use Splenda or for those of you who can handle it, Stevia. I’m not a stevia gal. Yes, I know different brands taste different but I promise you its not just that I haven’t found the perfect brand yet. We all have different taste buds and my taste buds have respectfully requested that I never again let stevia within a ten yard radius of them. They’ve been good to me, I owe them at least that much. I am using Swerve because it essentially has zero net carbs whereas Splenda has carbs (not as bad as sugar though). Swerve is a little pricey but I’ve been using this bag for over two months now. I paid $10 for this bag at Sprouts but Amazon has two bags for $15 right now. If you want to find it local, I’d check out a grocery store like Earth Fare, Sprouts, and the like. Fruit is pretty carby so I have been avoiding it but berries are among the lowest carb fruits and are okay once you get the ball rolling and have been low carbing for a while. Blackberries, blueberries, raspberries, strawberries – whatever cranks yer tractor is fine here. Almond meal/flour, sweetener of your choice, softened butter, vanilla, cinnamon, chopped pecans, and 2-3 cups of berries of your choice. Frozen berries are fine to use in this, just add a few minute extra to the cooking time. 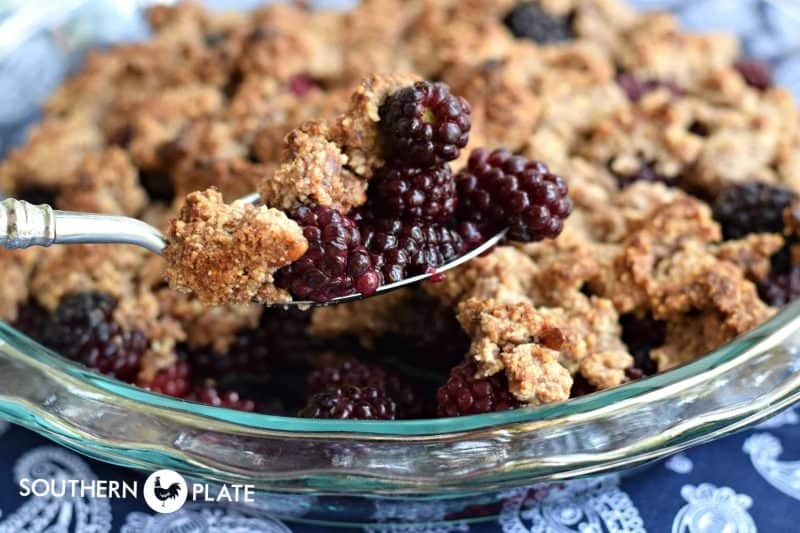 Place berries in the bottom of a pie plate. Sprinkle just a bit of sweetener over them if you like. I added a teaspoon of Swerve, which would be about two teaspoons of Splenda. To me, Swerve is sweeter than Splenda but some folks don’t feel it is. Either way, do this to your personal tastes. 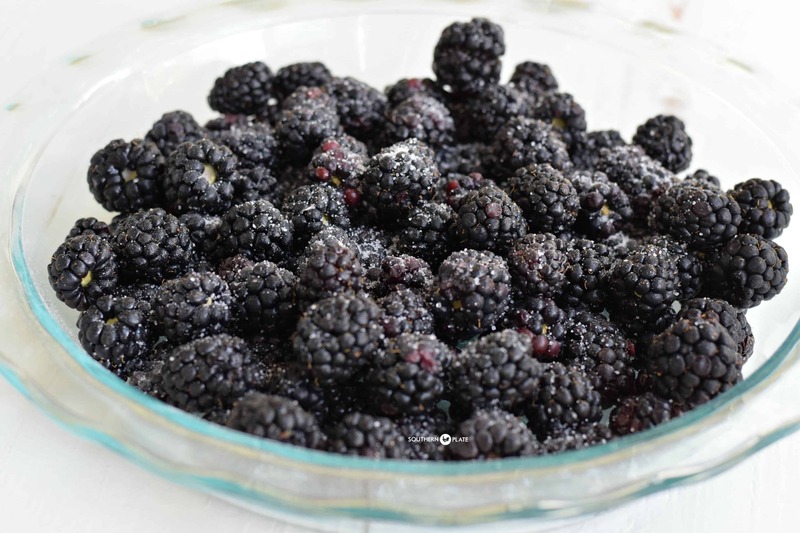 Note: It depends on your berries whether or not you will end up with a lot of juice in the bottom of your pie plate, my blackberries burst forth with juice with each bite but they weren’t drowning in it like you are used to seeing with super sweet crisps and cobblers. They were so good, though! SOOOO GOOD! In a medium bowl, place almond meal, cinnamon, sweetener, vanilla, and butter. Cut this together with a fork until it looks kind of like this. It won’t be dry like a normal crisp topping, but will be a bit more like cookie dough. Now stir in the chopped pecans. TASTE OF THIS! IT IS SO GOOD! I could just eat the bowl. Also, once you taste it you can decide if you want it sweeter at this point. Now pinch off bits of this and blop them all over the top. Blop! Blop! Until the top is all covered. Bake at 350 for 30 minutes or until it is lightly browned on top. A few minutes before it is done, send your entire family out of the house on an errand. And enjoy a delicious berry crisp with no guilt. Place berries in bottom of pie plate and sprinkle with a teaspoon (or so) of sweetener. Set aside. In medium bowl, place meal, sweetener, butter, cinnamon, and vanilla. Cut together with fork until a dough is formed. Cut or stir in pecans until well incorporated. Using your fingers, pinch off bits of topping and place all over top of berries. Bake at 350 for 30 minutes or until lightly browned. Serve with heavy cream poured over the top (in place of ice cream), if you like, or on it's own. *You may want to use more sweetener, especially if you are using Splenda. Sweeten to your taste. Using Swerve, this was just enough for me. 1 cup butter…is that 2 sticks?! I’m so glad you posted so soon after this went live! I meant 1/2 cup of butter, but it is two sticks because half sticks are pictured. Thank you!! I corrected it. I am trusting you on this Swerve deal, Christy, I just ordered some. So far you haven’t steered me wrong. You’ve even given me the push I needed to give Keto a try, and I love hearing about your results and would love more meal and recipe ideas. It’s not so bad now that I’ve discovered that I can get the liquid equivalent of Splenda (EZ Sweetz), which is zero carb, and have my beloved iced tea and lemonade. It’s the first sugar replacement that I’ve been able to tolerate the taste of, so I’m delighted. 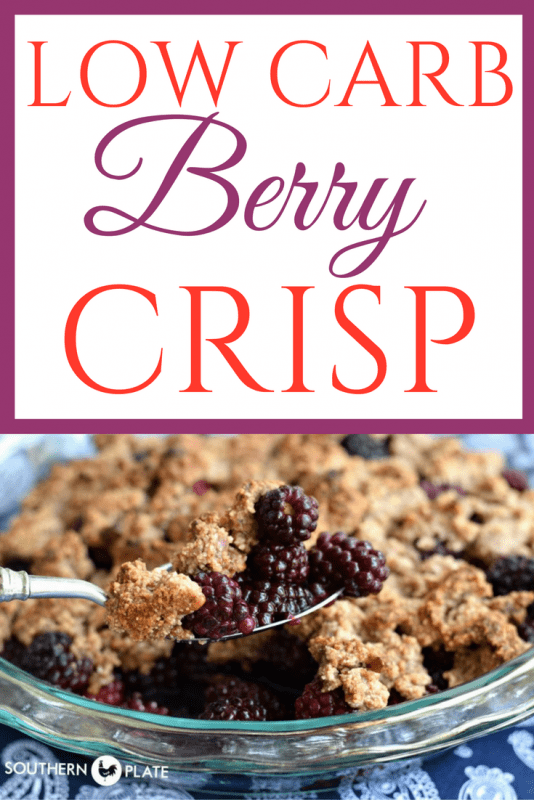 This berry crisp looks AWESOME! 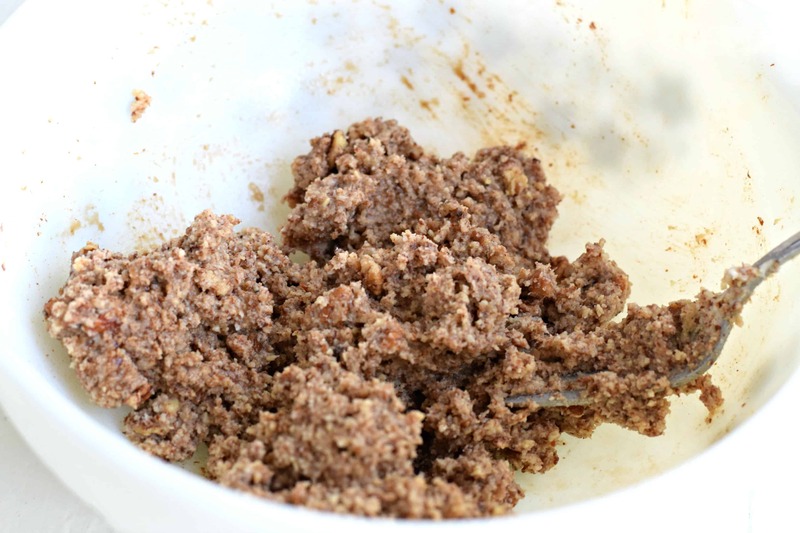 I’ve got a recipe for low carb chocolate no bake cookies coming up with it!! Thank you for the recipe and thank you for sharing about your low carb lifestyle; this is the easiest diet I have ever tried plus I feel great. I’ve lost ten pounds in less than a month; twenty more to go until goal weight. Keep all the great low carb recipes coming! I agree! I’m kind of shocked at how few hunger pangs I get anymore and I’m not craving sugar 24×7 anymore. I lost 8 pounds the first two weeks! Me too! I have found that as long as I stay away from the carbs, I have no cravings. But even one splurge, especially bread or sugar, and suddenly the cravings come raging back! Good incentive to just say NO! Not only low carb, but gluten-free, too. Yeah!! I am always looking for new recipes for my celiac husband. Can’t wait to try this recipe. I love a good, healthier fruit crisp! I use almond flour and coconut flour all the time, and various natural sweeteners, too. Awesome as always sweet lady! That sounds wonderful. Blueberries are plentiful right now so I’m going to use them. My family will love this so much,I’m going to send them on an errand before before I start mixing. Bless you Christy. Linda Rains , a faithful follower. Thank you for your comments about stevia. It tastes really awful to me, but people who use it don’t understand that when I tell them! I have encountered the same thing. I really and truly believe it tastes good to some folks but I just don’t think it is like that for everyone. Same. I’ve tried it in my coffee, and I just can’t tolerate it. Thanks for the Swerve tip. I’ve never heard of it. Will give it a try! I had to get use to stevia. My in laws use it in their tea and I couldn’t drink it at first but once I went keto it taste so sweet to me now! But I want to order the swerve and try it also. I like stevia in certain things but not others. For me it’s great in iced tea but not in coffee. Since it is twice as sweet as sugar if you use less -say half a packet – it adds a sweet note without the aftertaste. I use it in whipped cream, and on berries. A packet in my home made bolognese gives the tomatoes a little pick me up. I HATE MEAL PLANNING! Your recipes are making things so much easier! Now, where is the low carb vanilla ice cream that goes on top of this?! Hey! I talk about the ice cream in the post. Pour a bit of heavy cream over your crisp and you’re jamming away – so good! There are also several low carb ice creams out there. Rather than an ice cream in a tub, though, my husband and I have come to love the Blue Bunny Sweet Freedom bars. We get the ones that are vanilla ice cream coated in a chocolate crunch coating. I think they are about 4 carbs each – and wonderful! This recipe sounds wonderful and plan to make soon. I don’t call Low Carb a diet because it is my way of eating now. I feel so much better. No heartburn anymore–joints feel better and not so stiff. So glad to hear about the Blue Bunny Sweet Freedom Bars. Since eating low carb have not stopped by the ice cream freezer but will sure look for it now. Thank you for sharing with us. It does change your life doesn’t it? I’m sorry you were disappointed. We really enjoyed this. Of course, it isn’t going to taste as good as the full carb, full sugar version 🙂 After a few months of no berries, no crisp, and no cobbler, my husband and I loved every bite of this low carb dessert. 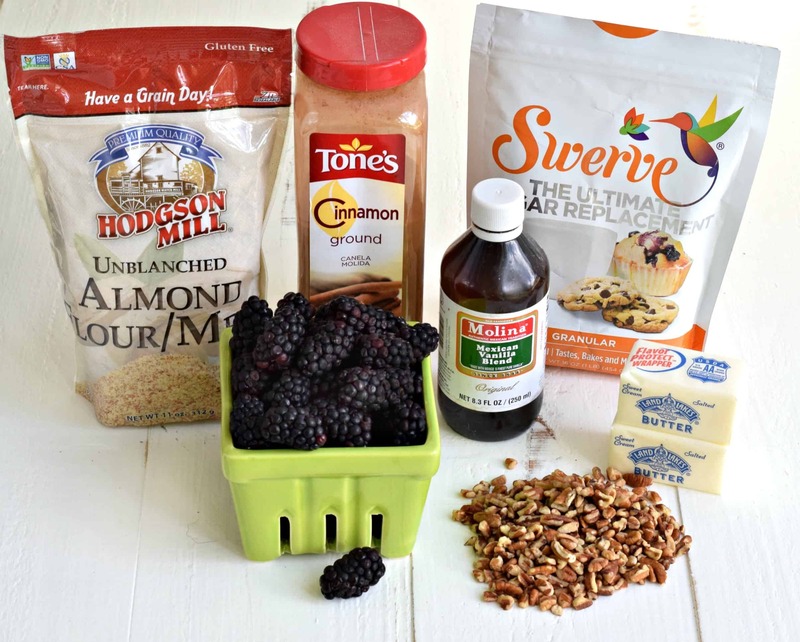 Almond flour and swerve have a ton of uses in a low carb kitchen! You say you usually love my recipes but this is the first time you’ve left a comment. Please come visit other times, too, not just when you have something disappointing to share. Both of us are missing out in that case. Oh no gobto walmart to get almond flour. 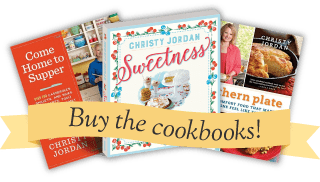 Christy, thank you so much for the low carb recipes. I’m new to eating very low carb and the post on how you adapt recipes have helped me so much. Looking for my blood sugar numbers to be lower. This looks wonderful! We have blackberry bushes in our yard, and they will be getting ripe in the next week or two. I’ll have to give this a try! I hope you enjoy it Marybeth!! Lucky you MaryBeth. I had to pay $10.46 for 18 oz. of berries. I made this crisp and loved every bite. I put a piece of it in the freezer for one of my sons, and then ate his slice also. Made this with blueberries and it was very good! My girlfriend has been eating this way for a couple of years and she refers to it as Paleo. Mostly meat and veggies, like you indicate. We are going to bite the bullet and give it a try…couldn’t hoit! I am so glad you liked the cobbler Jennette!!! Y’all will do great, I can’t wait to hear results!! Yum…did mine using raspberries…so good…thanks! Just need to know how to store it, please in the frig or on the counter? I would store it in the fridge but a lot of people do keep it on the counter coveted. 🙂 glad you liked it! So I just tried it for breakfast this morning with some Greek yogurt mixed in, it was like having a parfait! Can’t wait to try it, Christy! I considered low-carb after reading your post about it. I thought if a good southern cook like you can do it, I can, too! Going to the doctor gave me the push I needed. Labs are within normal, but high-normal. If I don’t do something now, they’ll keep rising. Mom and grammie were both diabetic, and I don’t want to go there! I know your site isn’t about just low-carb, but I would love to continue to see recipes here and there that you’ve tried and love. Every little bit helps! Thank you, sista! My bag of Splenda lists that there are no carbs? Am I reading it wrong? This recipe was delicious. Thanks. There is 1/2 a carb per teaspoon so the bag should say less than one carb per teaspoon since that is how they measure it. In this recipe, that would add about 6-8 carbs, depending on how much you use. I have tried clicking on the link at the top of the post about Community and it is a 404 error not found. Just made this last night and LOVED it! To help me not eat it all at once, I made it in a muffin pan with silicone liners! Now I have 12 mini crisps! I also added 1/4 teaspoon of nutmeg! SO GOOD! I am so glad to hear that you liked it Heidi!! Great thinking on the muffin tin!! Christy, this is a very good low carb dessert. 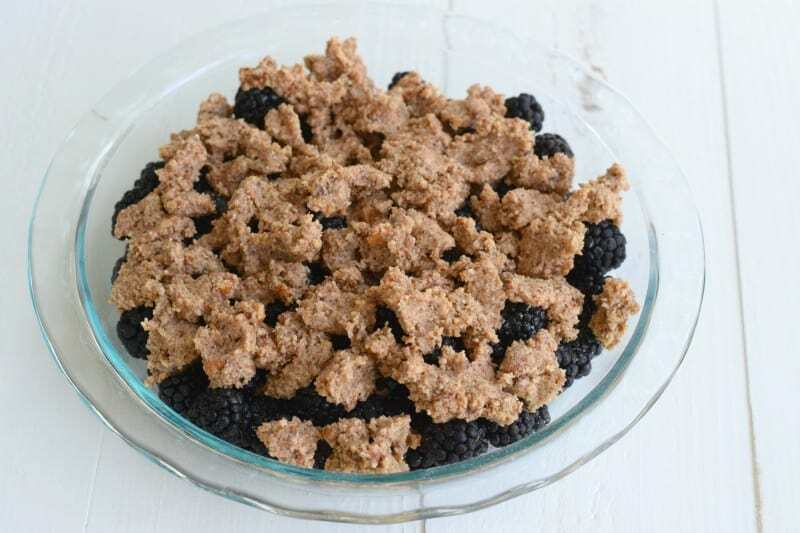 Like several of your readers stated, after not having desserts for awhile after going on the low carb eating plan, we were delighted to have such a good dessert. Low carb eating is a good way to lose weight and I appreciate your help in giving us some very good low carb recipes. The low carb eating plan has helped my husband keep his blood count down. I am so glad to hear he is doing well and thank you so much for trying my Low Carb Berry Crisp!! I am so glad to hear that you liked it!! I would love to make this for my family as we’re trying to adopt a lower carb lifestyle. I struggle with baked goods because my daughter is allergic to almonds and so many recipes substitute almond flour/meal for regular. Is there something else I could use in this crisp and, if so, how much? Thank you! I am new to keto. What is the nutritional breakdown of this dessert? Net Carbs, etc. Hey Jennifer! I don’t offer nutritional breakdown information here as there are too many variables on the reader’s end that I am unable to control. BUT your new best friend is going to be myfitnesspal.com. It’s free and you can input any recipe or food item to get a complete breakdown. They also have an app. I think you’ll love it. There are other apps and websites as well but this is the one I use.